a unique link that allows you to route visitors to different landing pages. When a visitor clicks your link he will be redirected to one of the multiple URLs you have added to the rotator. There are different delivery rules you can setup: Sequential, Random, Weighted or Spill-over. A rotator is necessary when you want to perform A/B test experiments to evaluate which of your landing pages is performing better. This is particularly helpful when you’re tracking conversions (sales, opt-in’s, etc…). Our rotator is one of the best rotator services available on the Web: reliable, scalable and high performance. 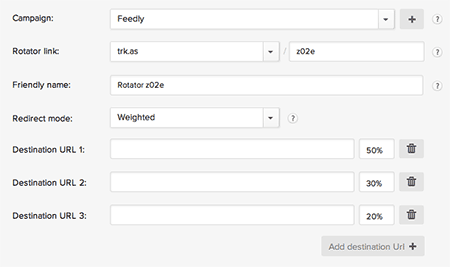 We’re constantly updating our rotator with new features at no additional costs to our customers. The technology powering our rotator service is based on ClickMeter’s redirect engine that is currently used by thousands of companies and marketing professionals, including World top affiliate marketers, to route millions of links and track several billions of clicks each month. ClickMeter links rotator service is fully hosted on Amazon AWS with a 99.99% guaranteed uptime: No code to install, configure or update and no technical skills required. Access your ClickMeter Links rotator by purchasing a ClickMeter plan. 30 DAYS MONEY BACK Guarantee on all plans: you LOVE our product or your money back.